It was a steep learning curve for motorcycle racer Tom Neave as he made his British Superbike debut at Thruxton last weekend. 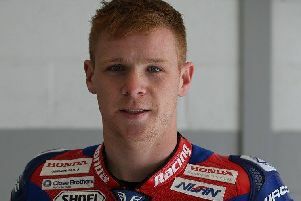 The Market Rasen rider was asked to ride for Honda Racing in the seventh round of the championship, standing in for the injured Dan Linfoot, but crashed out of both races. Tom made a steady start in free practice, and was considerably faster than ever before at Thruxton circuit having last year ridden the circuit in the Superstock 600 series. He qualified safely and gained a place on the eighth row of the grid for the start of Sunday’s first 20-lap race. A small crash in morning warm-up was followed by a crash at Nobles in race one while holding 13th place, and in race two he was caught out at the Club chicane while in 16th. It was all good experience for the 23-year-old rookie who will get another chance to ride for the team at Cadwell later this month. “I have really enjoyed this weekend and loved every minute and every lap,” Tom said. “I have progressed and got faster and faster and my confidence has grown. “Sadly the races didn’t end so well for me and I’m sorry to the team for my crashes. Twin brother Tim also headed to Thruxton for the British Supersport series and completed his qualifying in 15th place for a fifth-row start for Saturday’s sprint race. He made good progress up to 13th on the first lap before becoming embroiled in a fight for position with Tom Oliver throughout the 12 laps. Positions were exchanged between the two riders until Tim finally overcame his opponent to cross the finish line just a-fifth-of-a-second ahead to take 10th place. Two riders ahead were in the GP2 class and were excluded from scoring points, lifting Tim to eighth place and eight championship points. Starting Sunday’s feature race from row four, Tim held 12th place for the first few laps before dropping back to 15th on lap seven. He then mounted a comeback and was running in 11th when the race was red-flagged when two of the leading group crashed. A result was declared and because, once again, some riders ahead were in another class Tim was awarded eighth place for eight more championship points, bringing his total to 66 to stay in 12th overall. The next round is at the twins’ local circuit of Cadwell Park from August 17 to 19.